Penguins didn’t really mail me a postcard but their friend, penguinologist Dr. Tom Hart who spends half his life in the presence of wild penguins sent one on their behalf. Postmarked from South Georgia the note exclaimed, “we’ve persuaded about half the krill fishery to move off shore away from the penguin colonies!” This is exciting news as fishing ships harvesting krill to improve our memories compete with penguins for food. Antarctica is a bucket list destination for many tourists but they will sleep on comfy cruise ships. Spending nights on the white continent even in summer is hard. This is the windiest, coldest and driest place on earth. Doing research by placing people near penguin colonies is difficult and expensive. Hart came up with the idea of putting cameras – not people- in colonies. The cameras take pictures year round and the images provide important data on species numbers, dates on breeding and chick rearing activity, and colony health. To get the cameras to the penguins, Hart partnered with Quark Expeditions. Hitching a ride on a cruise ship saves hundreds of thousands of dollars in research costs. After setting up cameras, Hart trains ship naturalists to change camera batteries and collect memory cards on subsequent voyages. Quark passengers learn from watching Hart and his team and enjoy impromptu penguin talks over drinks. Some will even join other citizen scientists in identifying penguins from the photos. Since the project’s start in 2014 Hart has gathered enough data to influence policy. “I believe there is enough krill to go around if the ships harvest krill ‘downstream’ of the penguins,” Hart said. So when I read my postcard with the news people were swayed by Hart’s research I applauded him for using technology and tourism partnerships to overcome Antarctica’s harsh climate. His work will ensure future travelers still see penguins. Learn more here. Postcards from Penguins – Click to Tweet. My friend, @Reinventure, recently received a postcard from penguins. Discover more: Click to Tweet. 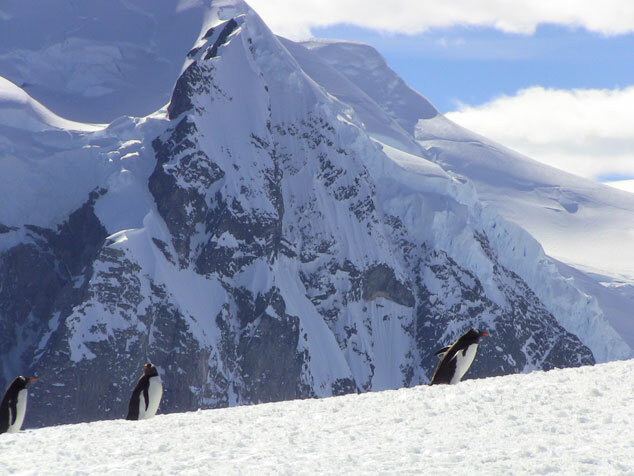 Is #Antarctica on your bucket list? Here’s another reason to visit: Click to Tweet.